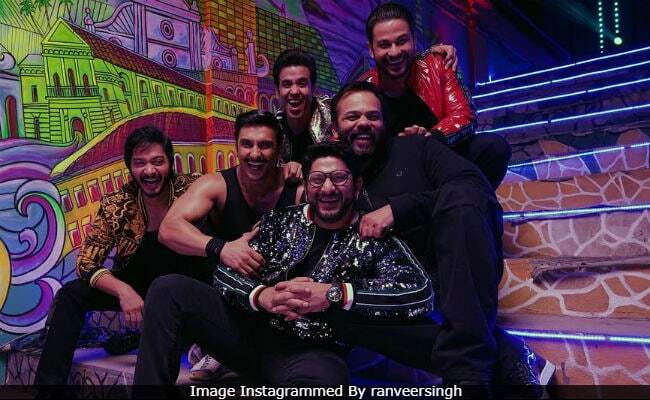 Ranveer Singh treated his fans to a fabulous photo from the sets of his forthcoming film Simmba and it features Golmaal stars Arshad Warsi, Tusshar Kapoor, Shreyas Talpade and Kunal Kemmu. They have reportedly shot for a special song sequence for the film, also starring Sara Ali Khan. "Hamari film mein chaar chaand lag gaye," Ranveer captioned his post with Arshad, Tusshar, Shreyas, Kunal and filmmaker Rohit Shetty, who is also the director of Simmba. Ranveer also posted a Boomerang video with the actors and Sara, in which they can be seen doing the hook step of Golmaal's title song. "Everything's gone a bit Golmaal," he wrote. On Tuesday, Arshad Warsi had confirmed to news agency IANS that he will feature in the redux version of his song Aankh Maare in Simmba. "Simmba has the remix version of my song Aankh Maare... So, Rohit Shetty asked me to do a special appearance and I was more than happy to oblige," IANS quoted him as saying. All the Golmaal films have been directed by Rohit Shetty and they have performed well at the box office. The last film in the series - Golmaal Again - released last Diwali. Coming back to Simmba, the film stars Ranveer as a cop while Sara plays his love interest. Simmba is a remake of Telugu film Temper. Earlier this week, pictures of Ranveer and Sara from the sets had gone crazy viral. Produced by Karan Johar's Dharma Productions, Simmba is slated to release on December 28.